I'm thrilled more women than ever have secured seats in the House of Commons and that Prime Minister-designate Trudeau plans to appoint a cabinet half staffed by women. While these events are historic markers for women's advancement, they have come to pass at the expense of gender diversity in Canada. Feminism gets pigeonholed as a movement for women's advancement, rather than an inclusive movement toward gender justice. Victories in women's advancement often erase and exclude non-binary and indigenous genders by carving ideas about gender parity into political discourse. Gender parity is misguidedly presented as gender equality, as if there were only two genders. 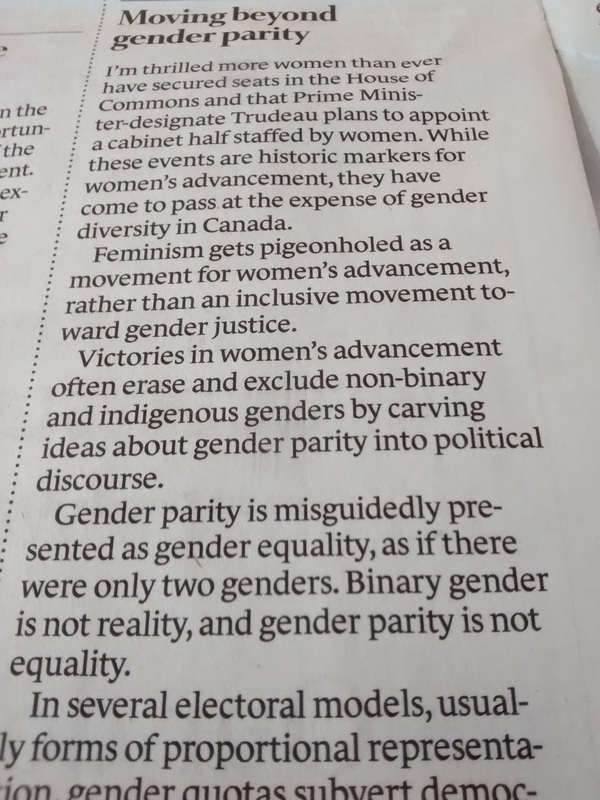 Binary gender is not reality, and gender parity is not equality. In several electoral models, usually forms of proportional representation, gender quotas subvert democracy so that the result of an election is more ideologically palatable to those in power. Descriptive politics are a metric, not a goal. Comparing the appearance of a parliament to the appearance of the electorate offers a glimpse into overarching social relations, but Members of Parliament are not elected for their appearances. Politicians are elected for their experience, ideas, personalities, talents, and community roots. Gender quotas ignore the real political work that needs to be done removing barriers from participation in formal politics and substitute women's advancement for gender justice. 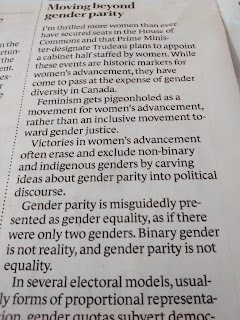 Instead of advocating gender parity, advocate gender pluralism. All genders deserve equal opportunity to participate authentically in public life.